Clanview asks you to think differently about publishing and sharing your family history in order to reach the hearts and minds of those that matter most. 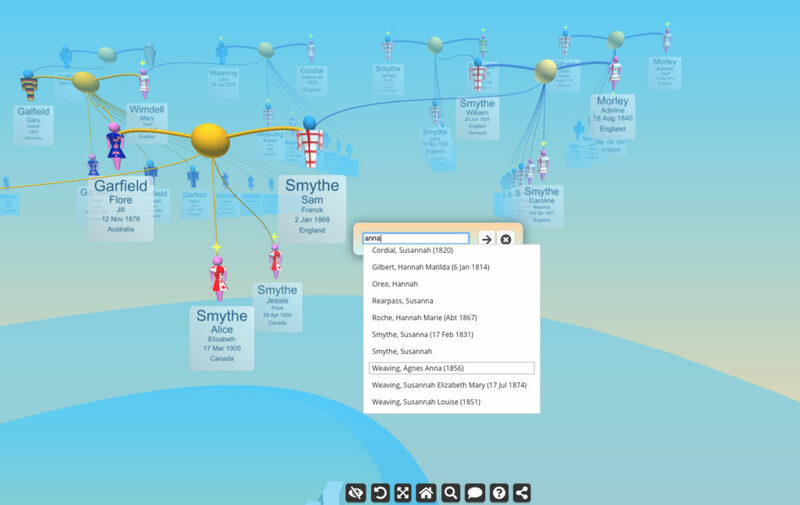 Here are some of Clanview’s features that will help you breathe new life into your family history. Clanview offers a new way to publish your family history – one that doesn’t involve a book publisher, generating dry reports or website development. 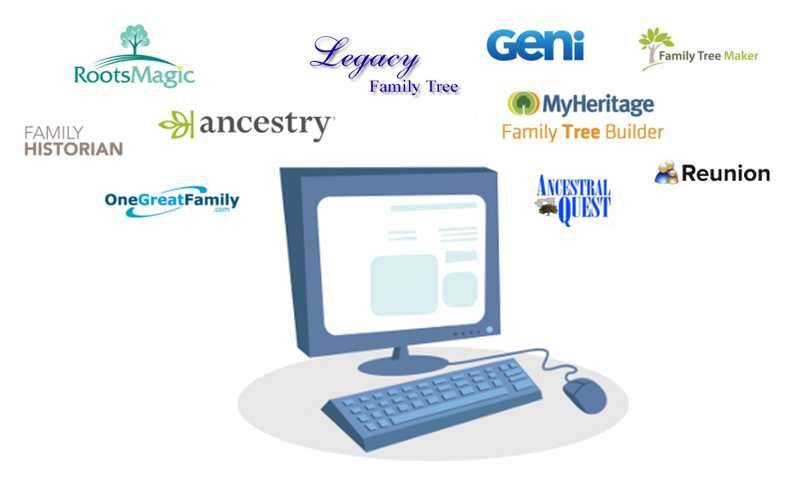 Simply use the family history data you have already gathered in one of many possible genealogy research programs – old or new. If you can’t use Clanview with your data we will happily fix it or refund your money. Once created, your Clanview model can be shared with trusted recipients, and explored independently – free from all research applications and online services. Clanview is designed to connect with every family member that explores it. We believe that everyone, even those people with just a general interest in their family history, need an instant and engaging way to explore their ancestors no matter what device they use. 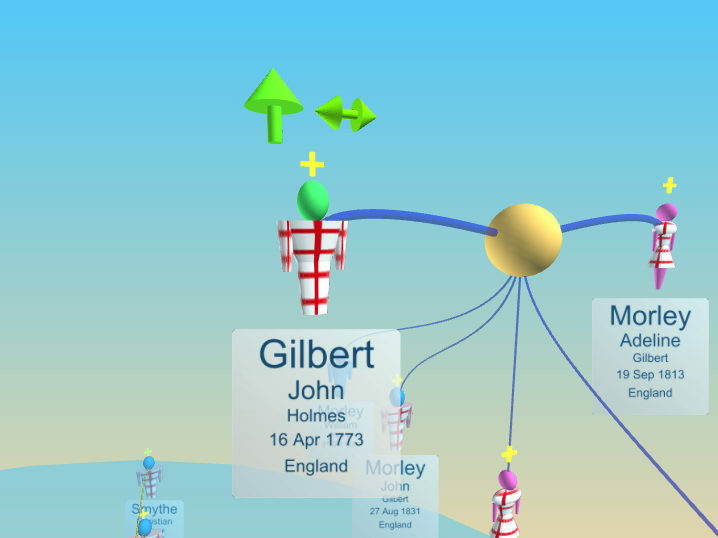 A simple Search feature allows each recipient of your Clanview to quickly find themself and become the centre of attention in their own family tree. And support for touch devices means that smartphone and tablet users have a tactile model they can tap, zoom and rotate to intuitively explore family relationships and stories. Each Clanview is created by simply using the family history information already collated by the researcher, but Clanview deliberately hides the details that can easily overwhelm the casual viewer. But what if someone wants to know more? 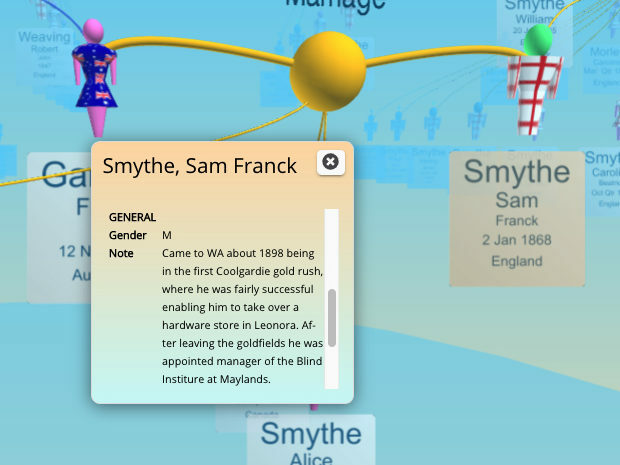 Any relative exploring Clanview that wishes to dig a little deeper simply needs to tap or click the ancestor’s information card to reveal a scrollable window containing the extra information and stories that relate to that person. Clanview does not try to display everything at once – not only does this confuse the user but it presents a lot of irrelevant information. When exploring Clanview, some ancestors may appear with a gold “plus” sign above them, indicating there are more relatives to see. Selecting this person reveals one or more green navigation arrows that can be double-tapped to reveal more ancestors, more descendants or perhaps multiple marriages. In this way each user finds their own path through ancestors of relevance and interest to them. Clanview is a read-only view of your family history that provides the ability to share your family history and not only encourage feedback, but control it. 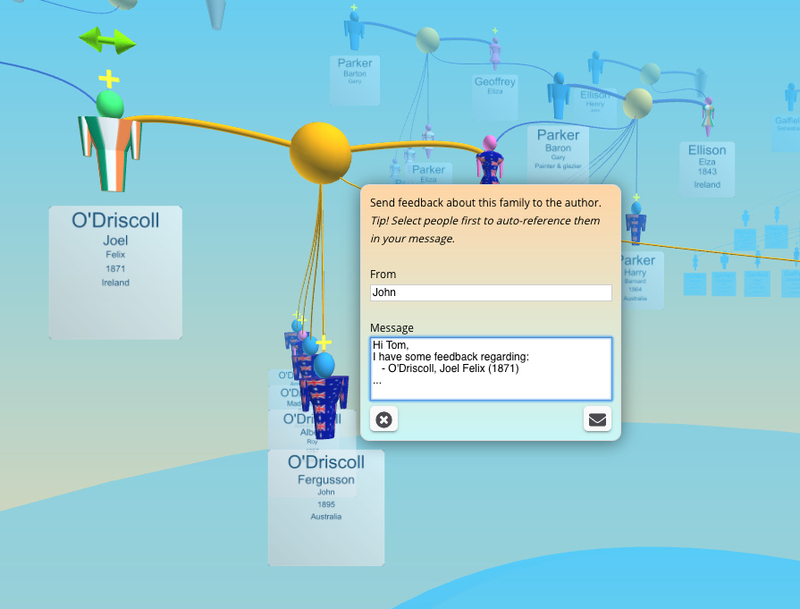 A convenient “Feedback to Author” function is built in to Clanview allowing each recipient to send you comments about people they have selected. Feedback is received by email to then be validated so there is no more sharing and merging data that includes mistakes or unverified information. 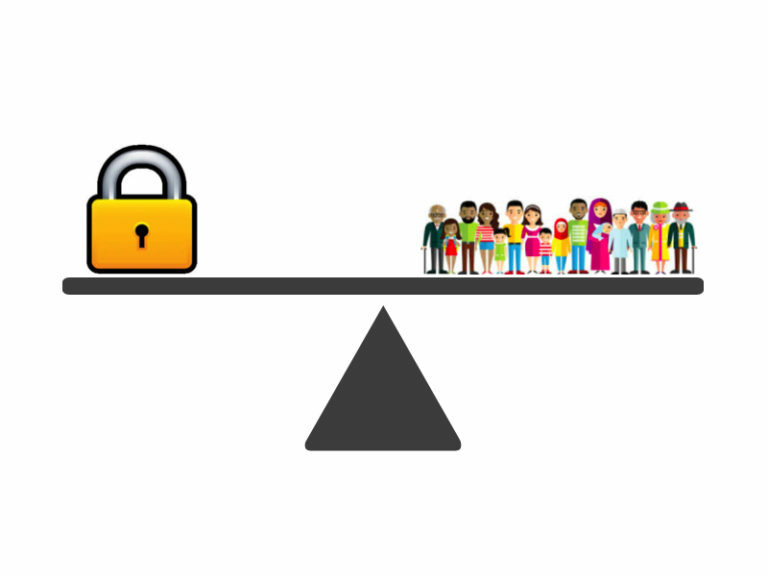 Clanview strikes the balance between ease-of-use and security – combining an intuitive user experience with safe, effective sharing. Each Clanview is created with its own unique web page – a special web address (URL) that’s impossible to guess but easy to share. You choose which trusted individuals you share each unique Clanview with. Where possible, Clanview automatically excludes personal information about living persons. Clanview expects all personal identification information about living persons to be excluded when exporting the family history data that will be used to create a Clanview model. Clanview has multiple security measures in place to keep your data safe and uses premium website security tools for protection. Clanview knocks down barriers imposed by other genealogy software that requires participants to also create accounts, buy software or own personal computers to be involved. Clanview delivers instant results conveniently into the hands of family members and collaborators. Creating a Clanview is easy!